We recently had a chat with Nacho del Campo, our Executive Chef to find out a little bit more about the man behind the tapas. So where did Nacho’s love for food take root? 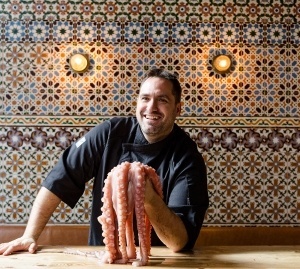 He spent his early years in Vitoria, the capital of the Basque Country, a region recognised as the gastronomic heartland of Spain where wonderful food and drink, friends and family are central to living. Nacho begins by explaining “my mum is an amazing cook and I always loved occasions when we sat down as a family to enjoy meals”. He was only 8 years old when he first realised he wanted to be chef. “I was home alone with my brother and we decided to make an omelette for dinner. That’s when I knew I wanted to cook”. When Nacho’s concocting new dishes, ethics and sustainability play a very important role. He explains that “when you’re putting together a menu it’s important to keep it balanced.” By balanced he means a healthy range of protein, vegetables and carbohydrates and not relying solely on meat as a source of protein. “I like to put beans (mongetes) on our menu when I can. They’ve sold really well, they’re an excellent source of protein and delicious”. In addition to a balanced menu, using as many seasonal ingredients as possible is the way forward. Nacho’s adamant that kitchens have their part to play in ensuring the world’s finite resources aren’t overused and says “as chefs, we need to use seasonal ingredients even if you think the sales might be slower”. That’s why Camino’s monthly specials are centred around seasonal supplies. So what does the future of tapas in London hold? “The healthy style of eating and trying to move away from heavily industrialised products is something that is starting to peak and I think more modern Spanish restaurants will continue to push for the quality of ingredients, rather than serving dishes that use sauces to hide their quality.” He also thinks we’ll see an increase in unusual cuts of meat on menus. 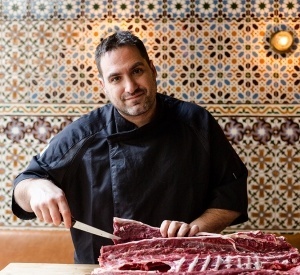 “It’s more important than ever that we use the whole animal.” He describes the way our new “Weekend Feasts” includes hanger steak, ribs and Ibérico secreto – cuts of meat that are less common. He would love the demand for seafood to increase as he believes the quality would dramatically improve and rightly points out that “we musn’t forget that UK’s an island”. British people tend to choose classic types of fish, forgetting about the huge variety of seafood we have on our coastlines. It can also overcomplicate traditional, wholesome dishes, “we shouldn’t stop making simple dishes just because they don’t look great on Instagram”. And dare we even mention Brexit? This year’s spring menu change is going to be the most complicated to date and like many others, Nacho worries about the implications of a no-deal Brexit on the UK’s economy and hospitality industry. “Over the many years I’ve worked as a chef, I’ve learned that one of the first things people cut down on when there are economic troubles is reducing the number of times they eat out and what they consume. It will become harder to staff restaurants because right now, there are mainly Europeans working in them.” Although he’s sure there will be hard times ahead, he’s optimistic that the industry will adapt whatever the outcome.